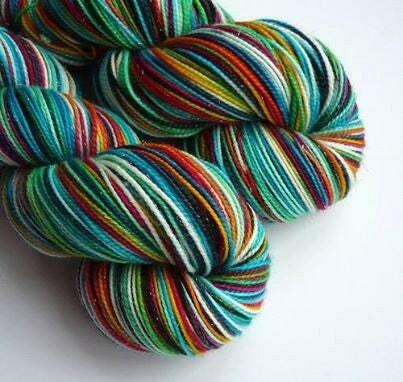 This listing is for custom dyed yarn, using something that you choose as inspiration. You can choose from a number of bases and send me your inspiration. It can be a picture, a song video, an album cover...or whatever you like. You can message me before checking out if you would like to discuss it first, or just take a risk and see what happens. My interpretation may be very different to yours, so please specify if there is a colour you don't want, or something you really do! In the event that you choose something that I have already drawn inspiration from then I will dye you the existing colourway. If you're looking for a different base please ask and I will see what I can do. Customs will be added to my list when payment is received, the list is worked in rough order. In the unlikely event that I don't have the correct base instock I will contact you. Expected turnaround time is detailed at checkout. Pictured are of some of my current colourways that I have dyed using inspiration from my customers! Gorgeous as always! Bought for my mum for Christmas and she is Very happy! Thank you! 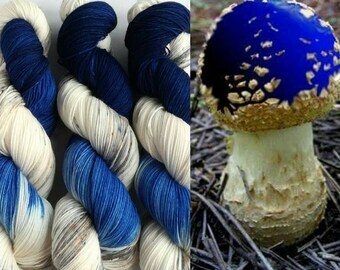 Hand dyed wool yarns. Custom, dyed to order, hand dyed yarn. Send me the inspiration!! Dyed from your pictures. Knitting, crochet, weaving.